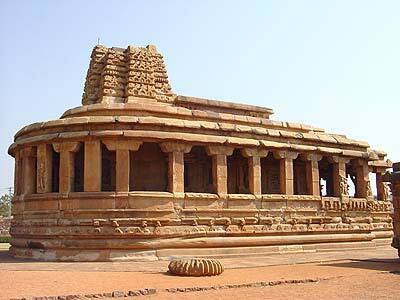 The name Aihole has an interesting story behind it. According to one legend, Parashurama after avenging the murder of his father came to the Malaprabha and washed his axe here. The river is said to have turned red causing him to exclaim "ai, ai! holi!" (ah, the river! 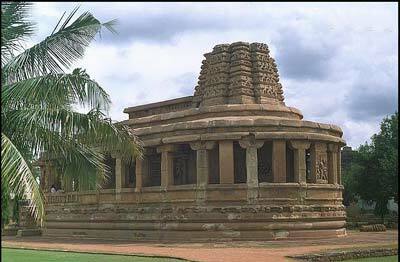 ).<br />This tranquil village on the banks of the Malaprabha River, Aihole is acclaimed as the cradle of Hindu temple architecture. There are hundreds of temples scattered around in the nearby villages and fields. The most impressive one is the Durga Temple with its semicircular apse, elevated plinth and the gallery encircling the sanctum. The Lad Khan Temple, which is one of the earliest temples, was originally a royal assembly hall and marriage mandapa chosen as the abode of a Muslim prince, Lad Khan. The Huchimalli Temple with a sculpture of Vishnu sitting atop a large cobra, the Ravalphadi Cave Temple celebrating the many forms of Shiva, the Konti Temple Complex, the Umamaheswari Temple, the Jain Meguti Temple and the two-storied Buddhist Temple are other sights worth seeing. 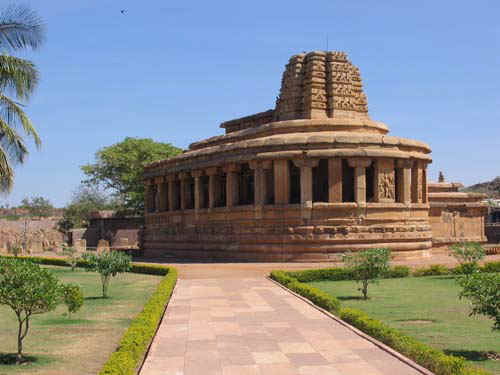 Located on the Malaprabha River, Aihole was the ancient capital of the Chalukyas and is situated in the northern part of Karnataka. It is around 450 kms away from the state capital of Bangalore. Aihole which is known as cradle of Indian temple architecture has several temples worth a visit. The Durga (Fort) Temple is the most decorated temple of Aihole. 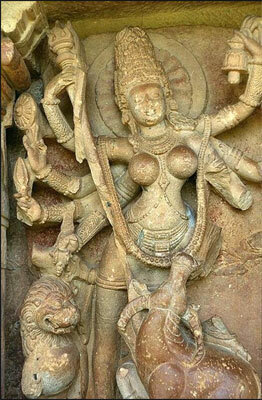 The fearsome idol of the deity slaying the Mahishasura is awe inspiring with the most minute details carved to perfection. There are over fifty temples within the fort walls and fifty outside - fine examples of Hoysala, Buddhist, and Jain, Dravida, Nagara and Rekhanagara styles. 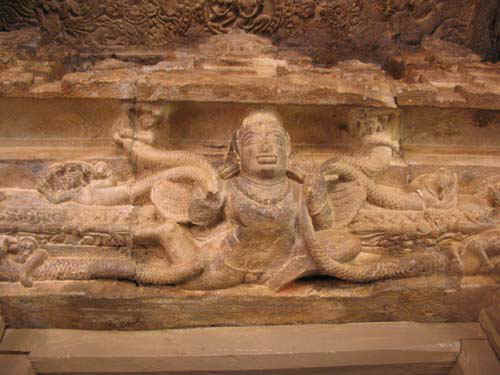 \r\nAn unusual temple of Hutchimalli has an idol of Lord Vishnu sitting on the head of his seat, the sanke Vasuki. 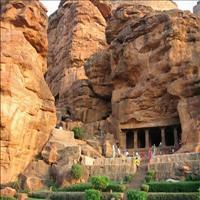 The Ravana Phadi Cave dates back to the sixth century. Dedicated to Lord Shiva, it has innumerous sculptures of Lord Shiva in His various forms. \r\nOther remarkable sites are the Konta Temple Complex of four temples, the Uma Maheswari Temple having a beautifully carved idol of Lord Brahma sitting on a lotus, the austere Jain Meguti Temple and the two-storied Buddhist Temple. There is a Buddha on the ceiling of the temple. The smile of the face of the Lord truly shows the tranquility that prevailed the Lord from within. 45 Km, about 19 Km north of Hungund, the pilgrimage center of Koodalasangama lies at the confluence of the Krishna & Malaprabha Rivers. On the banks of the river is the renowned temple of Shiva as Sangameshwara. There are idols of Basaveshwara, the famous saint composer, his consort Neelamma, Nandi & Ganesha, in the temple complex. 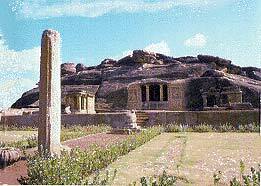 Basaveshwara is said to have spent his boyhood and later attained nirvana here. Facing the temple, in the midst of the river, is a small stone mantapa with a Shivalinga in it.